With a blog post like this, it would be assumed that there is an exciting story to go along with it. This assumption would be correct. Back home, Dana and I wouldn’t be considered “outdoorsy”, however Africa has given us the opportunity to do many things we wouldn’t normally do (i.e. Ostrich Riding). 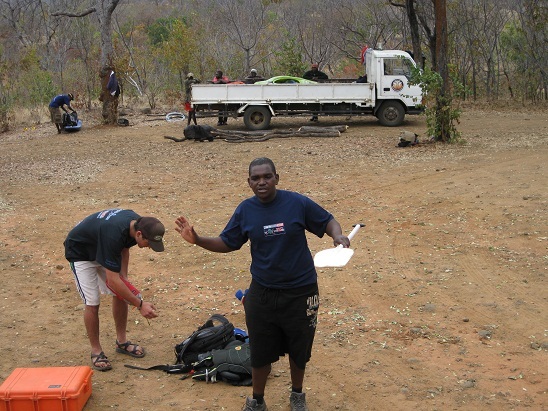 Our first real active sport thrill came when we arrived in Livingston, Zambia. 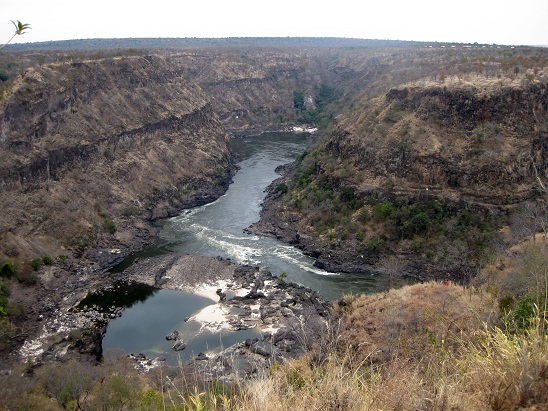 Despite no previous experience, we decided to sign up for a whitewater rafting trip down the Zambezi river, one of the four Great Rivers of Africa (the others being the Nile, the Niger, and the Congo). 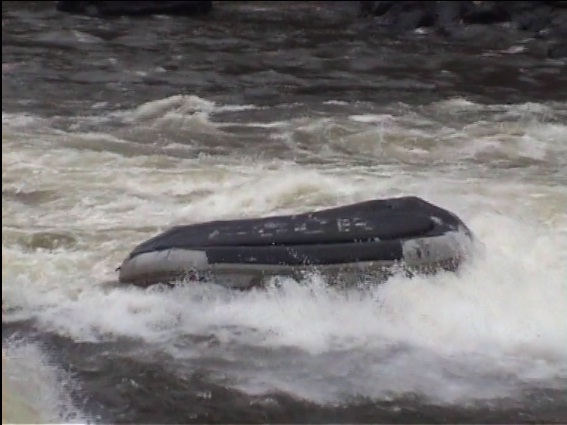 Oh yeah, did I forget to mention it’s a class 5 rapids? The site www.wikipaddle.com describes the section we were rafting as “extremely difficult, long and violent rapids, steep gradients, big drops and pressure areas… The river drops approximately 400 feet over the 25km distance often covered in a one-day trip”. Sounds good to me! After a early morning class from the guides teaching us most of the rafting basics, we headed out to descend into the gorge. Our guide, Tembo, was a jovial fellow who started us out down the river easy enough, instructing us when to paddle forwards, backwards, one side forwards while the other backwards, etc. Approaching the first few rapids were intimidating, but we managed to get through the first five rapids without much of a problem. Then came rapids 16a and 16b, aka Terminator 1 and 2. 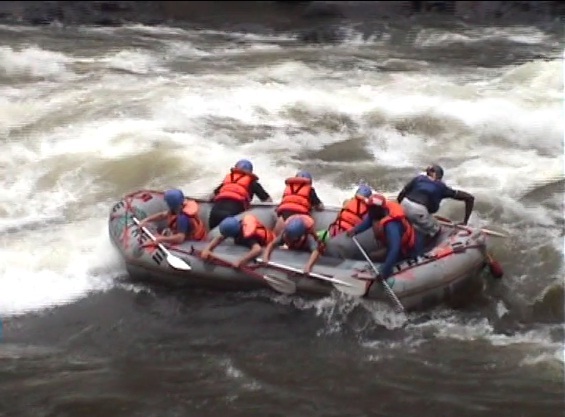 Our guide Tembo, showing us the finer points of whitewater rafting. A couple of the girls were pretty shaken up after that, but I have to give Dana a lot of credit for not being afraid the rest of the way down. 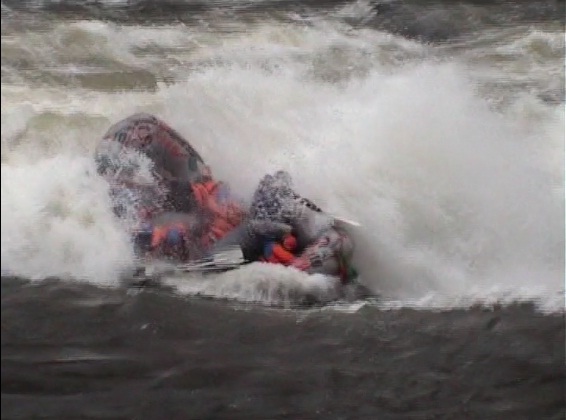 She may be afraid of spiders, but she can handle getting flipped on a Class 5 rapids with no problem. 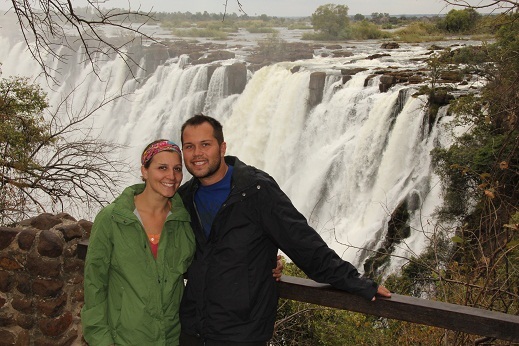 The next day we visited another UNESCO World Heritage Site, Victoria Falls. While not the tallest or widest waterfall in the world, it is known as the largest, covering 5600 feet in length and over 360 meters tall. It is called Mosi-oa-Tunya by locals, which means “Smoke that Thunders”. The reason they call it that is because of the spray that comes the falls is so strong that it actually “rains” mist around it and looks like smoke from above. That is one massive waterfall! 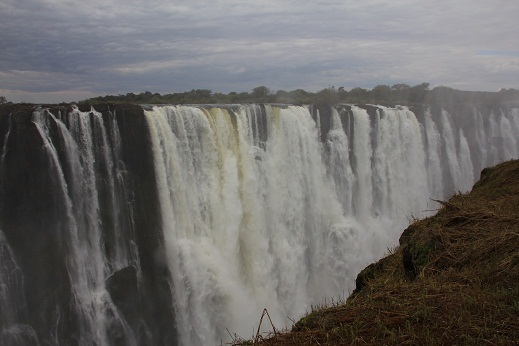 We really enjoyed our time in Livingston, Zambia checking out the sites and experiencing some pretty intense thrills! Our drive continues north to the Luangwa National Park over the next few days. We hope to see more African Wildlife once we get there. WOW! I’m glad to know you’re okay. So were the sequence of pics taken for you by someone from your safari with your camera? No photos of your trip down river w/o the raft or the kayak pick-up? What were some of your thoughts during that time out of the raft, or were you too much in survival mode to recall anything more than your post describes? 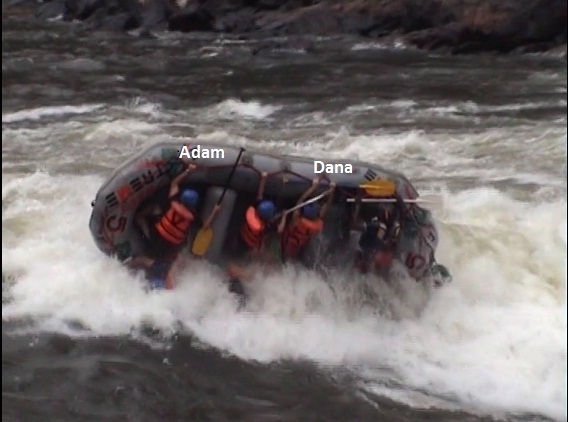 Did Dana hang onto the raft through the flip, etc.? I’m so glad you both survived. What an adventure! Thank you for the phone call today, it made my day. Can’t believe you called from a beach in Zanzibar while I’m sitting an office with no windows in Chicago’s terrible August humidity. Your blog lets me vicarious travel this summer. The picture of the two of you at the waterfall is really great and reminds me just how much we miss you. Enjoy you travels and continue writing – I love to follow along. See you soon, much love. Katherine shared the blog address with me today. Amazing! Nat Geo doesn’t have anything on you two! I’ll hold good thoughts for you as you travel “for us”. Thanks for sharing! Go safe! Looks like you guys are having a very exciting time and I envy you both. 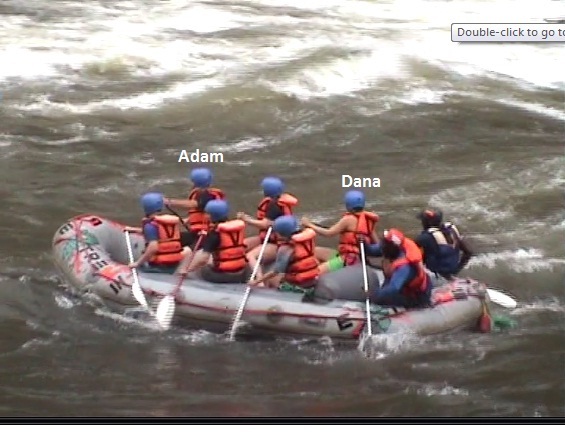 Awesome job hanging on through the rapids. Be safe and continue living life and loving it! Oh S&*t is definitely right! that is awesome that you guys were able to get snap shots of that! !